William S Burroughs is cited as “one of the most politically trenchant, culturally influential, and innovative artists of the 20th century.” His legacy continues to foresee what now fills the headlines of the world today. Burroughs’ writing and ideas changed the course of literature and his multi-media collaborations spawned new directions in film and music. 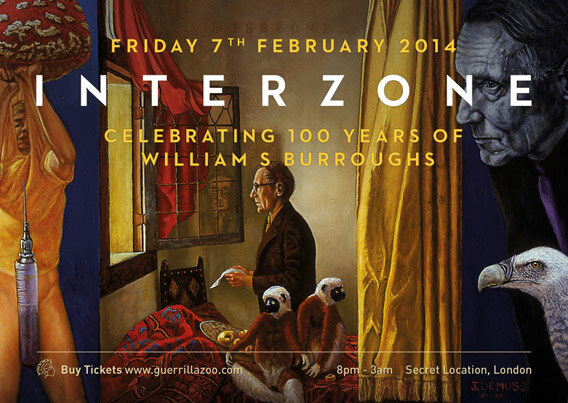 To mark the William S Burroughs centenary, a few days after what would have been his 100th birthday, Guerrilla Zoo presents an experiential event inspired by his life and times. Based within the strange and seedy surreal “metaphorical stateless city” of ‘Interzone’ inspired by the cult beat writer whilst in the north Moroccan city of Tangier during 1950s, where he wrote his acclaimed influential nonlinear novel Naked Lunch (published almost 55 years ago). The event, which takes the world of Burroughs’ writing and brings them to life with an immersive spectacle, combines promenade theatre, music, performances art, films and art installations – Think Naked Lunch meets Punch Drunk.